SEATTLE, October 24, 2017 /3BL Media/ - KIRO 7, and The Trust for Public Land, today named Mark Boyar as Seattle’s 2017 Cox Conserves Hero. Mountains to Sound Greenway Trust, Boyar’s nonprofit beneficiary, will receive $10,000. Boyar was among the three finalists who were nominated by the public then chosen by local judging panels to compete in an online vote for the title of Seattle’s Cox Conserves Hero. The two runners-up will each receive $5,000 for their nonprofits of choice. Lisa Parsons selected Nature Consortium as her nonprofit of choice, and Jan Robison chose Chehalis River Basin Land Trust. 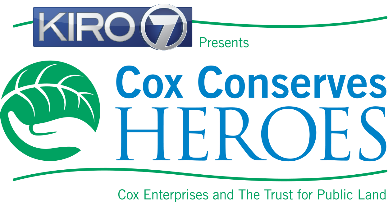 Cox Conserves Heroes was created through a partnership between The Trust for Public Land and Cox Enterprises, the parent company of KIRO 7, to honor local conservation volunteers. As either a finalist or winner’s nonprofit of choice, the following Washington organizations have received financial support from the Cox Conserves Heroes program: Carkeek Watershed Community Action Project, EarthCorps, Forest Fire Lookout Association – Western Washington, Greater Metro Parks Foundation, Green Tacoma Partnership, King Conservation District, Metro Parks of Tacoma, Mountains to Sound Greenway Trust, North Olympic Land Trust, Northwest Trek Foundation, Sustainable West Seattle, Washington Wilderness Coalition, Thornton Creek Restoration, Keep Island Lake Clean, Good Neighbor Garden Project, Fauntleroy Creek Restoration, Whidbey Camano Land Trust, Puget Creek Restoration Society, Plant Amnesty, King Conservation District and WSU Island County Beach Watchers. The national Cox Conserves Heroes program has donated nearly $800,000 to environmental nonprofits, and nearly 200 volunteers have been honored. Cox Conserves Heroes also takes place in Arizona, California, Georgia, Florida, Louisiana, Massachusetts and Virginia and is part of the company’s national Cox Conserves sustainability program that is celebrating its 10th anniversary. For more information, visit CoxConservesHeroes.com.